UPDATE: this question is now closed. See our new username changing policy for how to change your username. If you wish to have your username changed, you've come to the right place! Just post an answer requesting your desired name and it'll be changed. Please note however, that Pokemaster will not change it constantly, so think before you change. If Pokemaster denies your change, he will post a comment explaining why. Thanks to J98 and DT for helping with this. Please put your current name as well so that others can see who's changed names recently. 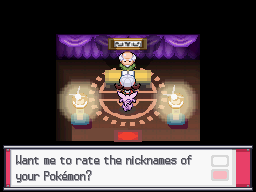 For example "Can I change my name from Pokemaster to UberPokemaster?" Answers will get hidden a week or so after the name is changed. Usernames are limited to 20 characters (including spaces and punctuation). Misleading/invisible characters like hidden spaces or soft hyphens are not allowed. Usernames may not contain "Pokemaster" to avoid confusion, nor contain swear words. If a user has a username you would like, you may "seize" it, as long as that user has no activity and registered more than 6 months ago. To make this easy for Pokemaster, please keep all fonts regular, and bold the name change. i forgot when i can get a name change...I'll wait a little longer, prolly 'til the end of da month then change. I have a question about an user. My friend ZeikGeit LetsPlays can change its name when he want to change it. My q is why can he do that en the other people not? commented Jul 12, 2013 by Maxorus! Trachy, this was reopened? Why is that? Yes but still no 800 points. [NOTE] PM dont change the name untill the votes are ready i will write the name change under this line when it is ready. Thanks! I think this whole voting thing is retarded. Just a name change, sheesh. Ok I have decided the winner with 7 Votes is....Airborne Articuno so anyway Pokemaster please change my name Elegant Espeon -----> Airborne Articuno thank wu in advance! I like Airborne Articuno the most! OH HECK NO I DON'T THINK SO! fros i want you to change from Elegant Espeon back to frosty frosslass please ;.;. Hello. I would like my name changed from WaterTiger back to SuperTyphlosion. Thanks, people, for helping me decide my name! Okay,so 3 months are over. upvote to what ^ he said! srsly, y u no DarkGoku?! anyway, I like Excadrill too, so I'm ok with it..
hahah me too! (i truly apologise on the un-necessary comment) BTW Dg, when can you come on chat? -CWegz: currently my showdown name and kinda my nickname at school. -Jolteon: my favorite pokemon and just want to take out the jovial part. Ive hated that part of my name for a while. I dont know why. I just did. -Ronnoc: This was my original name and I've just been considering it for a while. For those of you who dont know, it's just my name spelled backwards. Well thank you guys for this and below is the talley if you guys decide to vote. @RS: it was a joke. Can I have mine changed from dudepad to Uber_Nature_Gogoat ???? i would like to change my name from shinygliscor to Redspikachu. Can I please change my name from solitairy marowak to Lugia's Song? Pika Master to Master_of_Hoenn please. Suggestion about The PokemonDB Name Rater. I'm becoming confused with all of the name changes! You know how users w/out posts can change their name? I suggest we change that. Is There a List of All The Ranked Users? Can I get a list of all characters allowed in our usernames? Why are we not allowed to have @ in our usernames?